If you have black skin, it is important to keep your skin lubricated and moisturized. While creams in general are best for normal to oily skin types, some skin treatments give black skin a dry and "ashy" look if the skin is not properly hydrated. 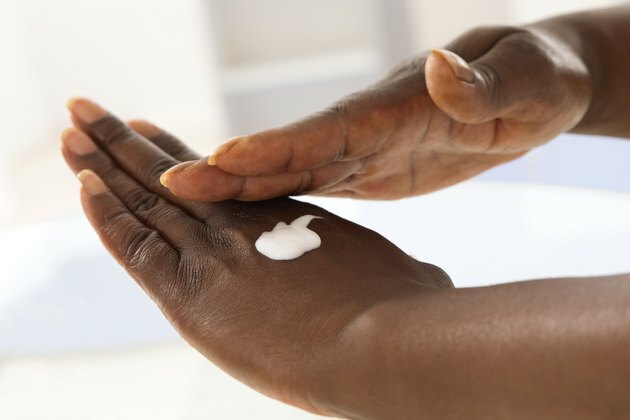 Because the effectiveness of certain moisturizing products can vary among certain racial groups, it's best to read the product carefully to determine exactly what it is made for and whether it is recommended for your skin type. In fact, if it's a cream made for normal to oily skin and you suffer from dry skin, the product could be counterproductive. A daily morning and evening skin regimen is essential for healthy African-American skin. Cream cleansers are best used by normal to dry skin types, while gel cleansers are more appropriate for normal to oily skin. Essence Magazine, a publication that focuses on fashion and beauty for black women, recommends Weleda Isis Cleansing Lotion. Essence Magazine recommends using eye creams containing vitamin K or horse chestnut to get rid of dark circles. Vitamin K is proven to increase circulation, while horse chestnut is proven to increase capillary wall strength. Massage the cream in gently, being careful not to pull the skin. After washing your skin and toning, apply an antioxidant-rich face cream to provide your skin with the nutrients it needs. During the day, the antioxidants will help to prevent sun damage when coupled with sunscreen, or you can select a day cream with sunscreen built in. At night, use a night cream to rehydrate and heal your face from pollutants, sun, sweat and dirt. Use body cream to alleviate dry, ashy skin. According to an article in Essence.com, C.O. Bigelow Lemon Body Cream is the best body cream to get rid you of rough elbows, knees and hands in addition to treating dry, ashy skin. Body creams are most effective when applied immediately after a shower to trap the moisture the skin has absorbed. Black skin is easily damaged, resulting in dark marks. Dark spots left behind from acne is common, and a daily skin regimen should be maintained to keep your skin clear. Another common cause of dark spots is insect bites, especially if you scratch the bites. To guard against insect bites turning into dark spots on the skin, keep a tube of anti-itch cream handy to prevent yourself from scratching and damaging your skin. Is it Safe to Exfoliate the Face Daily With Sea Salts?